Get Polished! Agency is a unique boutique agency created to provide talented, experienced, creative, and professional nail techs to the advertising, publishing, and entertainment worlds. Launching this month by celebrity manicurist Cinnamon Bowser, Get Polished! Agency is a unique boutique agency created to provide talented, experienced, creative, and professional nail techs to the advertising, publishing, and entertainment worlds. “Over the last five years I have had the opportunity to work with some amazing techs and I have met some influential decision-makers in the fashion and beauty industries, so I thought I would marry the two,” Bowser says. “The industry could benefit from a unique boutique agency representing a select handful of outstanding nail technicians.” The agency is recruiting experienced manicurists with strong portfolios for its roster. The bulk of the work will be done in New York City, but Bowser says the agency will consider representing nail techs in other cities who are committed to the profession and willing to travel. 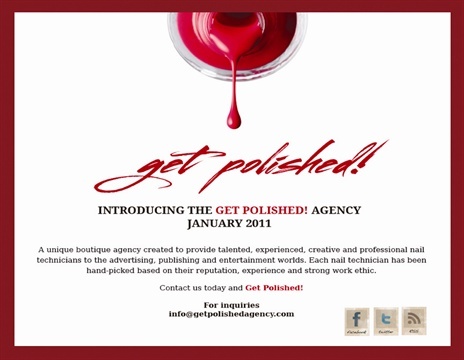 To be considered or for more information, e-mail [email protected] or visit www.getpolishedagency.com.